Are you sad right now because you just discovered that some of your favorite photos are damaged or getting faded and old? Let us help you get the joy back by sending us your damaged photo(s) and allow us to turn it back with the unique feelings it brings to you! Our photo restoration service will make you happy again, as we will restore any damage on your precious photos.No matter if your photo has stains, is torn off, is stuck on its glass frame, has grains or is faded, our highly trained experts will make wonders on your damaged photos in a matter of a few hours. We all know how it feels when our beloved memories that are typed on a photo are getting destroyed, and we all have wished we could get those memories and feelings back like they were at the moment our photos were shot. The destroyed photos along with the feelings and the memories they carry, have generated the need to somehow be able to restore to their initial condition. And today, thanks to the technology and the evolution of the photo editing tools, almost any damaged photo can be restored. All you need to do is to send us a scanned copy of your original photo in its current condition. We will do what is possible and even more to bring your photos back to their previous condition and even better! In the case of photos that are stuck in their glass frame, is not needed to remove them from the frame.Removing them will cause a bigger damage.It is preferable to make a photo of them with the glass and then we will be able to restore them as they are. While restoring your black and white photos, we can also add color as by your request. Our highly trained experts have great experience already, as we provide photo editing services for over a decade and we use the most evolved photo editing tools available today and we apply several techniques to achieve the desired result.By using the most evolved and sophisticated tools, we can guarantee the outcome, otherwise if we can`t make it, then it rather means that there was not a solution.We won`t accept payments on photos that you don`t confirm your 100% satisfaction.Depending on the degree of the damage and the work needed for a photo to get restored, the price will vary.Our turnaround times are the fastest possible, as we will be start restoring your photos immediately after you will send us your photos. So you don`t need to be sad and worry about your damaged photos and all those feelings and memories they carry! 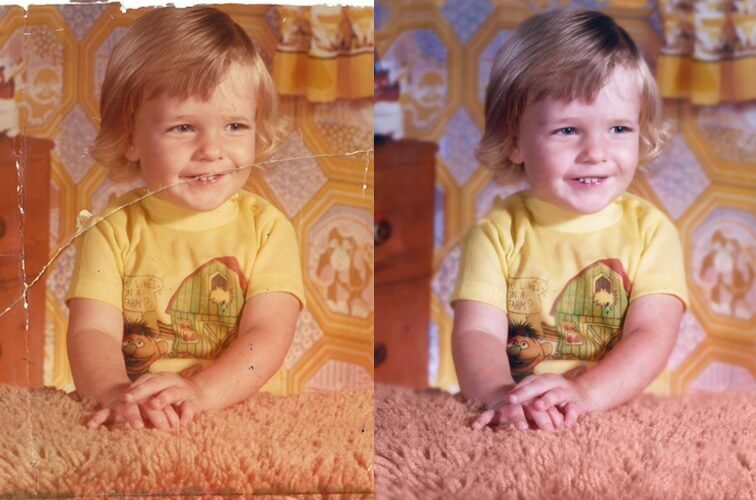 We are here to help you get your photos restored to such a degree, that will look like they were shot a minute ago! Never mind how damaged they are, we can restore any damage and give them life again.So, don`t wait for another second, just click the button below to upload your scanned photos along with your requirements on our safeguarded server, and we will start restoring them the next moment and we will turn them back to you as you ordered!